The Cultural Landscape and Archaeological Remains of the Bamiyan Valley is an outstanding representation of the Buddhist art that resulted from the interaction between man and nature especially from the 1st to 13th centuries CE. The kingdom of Bamiyan was a Buddhist state positioned at a strategic location along the trade routes that for centuries linked China and Central Asia with India and the west. 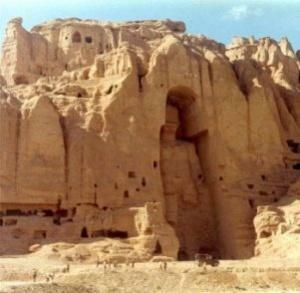 Many statues of Buddha were carved into the sides of cliffs facing Bamiyan city. The two most prominent of these statues were standing Buddhas, measuring 55 and 37 meters high respectively, that were the largest examples of standing Buddha carvings in the world. They were probably erected in the 4th or 5th century. In March 2001, the Afghan Taliban government ordered them to be demolished. This site is only one of the things Afganastan has to offer as a tourist attraction and I reckon it is a real beauty and a half.After all Afganastan have been through with the TALIBAN, Afgnastan has lost alot of tourist because the world still considers it to be an unsafe place. Belive me it it provides cultral and is a safe place-it does have it dangerous share of the place but then again doesn't every country? "suffered from abandonment, military action and dynamite explosions. Parts of the site are inaccessible due to the presence of antipersonnel mines."